From Bulguksa Temple, we took the bus up to the Seokguram Grotto. It’s possible to hike, but it would have been a very long 3.2 KM (2ish miles) in the 30C (90F ish) heat with incredible humidity! Even from the parking lot there’s a bit of a walk in, but it’s through the forest and beautiful. The grotto (actually a stone building built next to the mountain) was originally built in the mid-8th century and has a beautiful stone Buddha inside. There is also a small temple next to it. 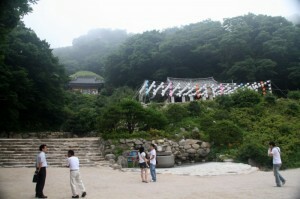 We finally got rained on a bit, waiting for the bus to go back down to Bulguksa.